Step right up, folks and see a medical marvel...right here in my ovaries to be exact! It's the "incredible shrinking follicles"! This is, indeed a kind of "medical marvel"; but certainly not the kind that I was wanting to be a part of or hear about today of all days. Friday was follicle study (f/s) #1. I'd been on Bravelle injects since Sunday, and I was feeling good. Really good, actually. No bad side effects, and I'd felt plenty of stimming in my ovaries. I just had a "good feeling" about this. And the f/s did show some pretty good news - a lining at 8 and three follies measuring at 14, 11, and 10 (they need to be at least 16-24 to trigger ovulation). So, not quite there; but pretty darn close. Mr. C and I were excited! Things were looking good. Dr. S said to go ahead and keep stimming with the Bravelle injects until today (Monday) when I would go in for another f/s and get ready to trigger. However, that was not to be the case for us. Photo from Prasad's Infertility. This is NOT a pic of my f/s, just an example. 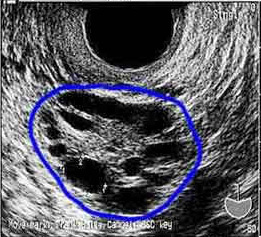 All those dark"balls" within the blue circle (aka: ovary)? Yeah, those are follicles - each one could potentially hold an egg that could be fertilized and become a baby - our baby. Dave began the ultrasound and told me my lining was "fabulous" - 10.5. Such a nice change from the mere 6.5 when I was on Clomid. I was riding high; this was looking great! Until I heard Dave whisper an "oh no!" I asked him what's wrong, and he said that my biggest follie had actually SHRUNK. That's right, folks; it shrunk! Our beautiful, sized-14 follie was now a mere 13.9; nowhere near close enough to trigger ovulation! ARGH! I was in shock to say the least. I thought it would be at 16 or 18 by now; but no, once again, my body has betrayed me. He said that the follie on my left ovary was up to 11.5 (still piddly), and that the other follie on my right side was now up to 13.5, nipping at it's "big brother's" heels. Still, none of them were large enough for triggering; and Mr. C and I were flabbergasted. Dr. S came in with that look on his face like he already knew I would be disappointed; which I was/am. But, he said it's always better to be able to keep stimming than have to cancel a cycle due to too many follies becoming mature. Two girls this morning had had their cycles cancelled because of this - 9 and 8 mature follicles, respectively. HOLY COW! I don't know which would be worse - not stimming enough follies, or knowing that you had enough good ones ready, but there were too many to risk them all getting fertilized and implanting (after all, who honestly wants a litter of babies?!). So, here I am AGAIN, stimming for three more days with Bravelle injects. *le sigh* I thought I was doing okay until we got out to the car, then I lost it. I didn't stop crying the whole 45-minute car ride home. I just felt defeated. After the cry and getting some errands done and getting my blood sugar back up to normal with lunch, I felt a little better. At least we can keep this cycle going. At least we have a bit of hope to hold on to. This cycle has been the most expensive yet. Inject meds are expensive, and all the extra monitoring adds up too. If we get pregnant this cycle, it will have taken us easily close to $1,500 to accomplish our goal; and that's not adding in all of the failed cycles we've been through thus far. It's staggering, and if it doesn't work soon, we'll have to take a break to regroup financially. It's heart and bank-breaking business this infertility. All I can do now is just pray, pray, PRAY that God makes this next round of stimming work! I feel desperate, and I hate feeling like that. After lunch, Mr. C and I drove around Branson taking pictures of all the flooding - it's terrible and incredible all at once - a perfect match to my situation today. I know there is a plan behind everything we go through, but that doesn't mean that I don't wish I knew what it was every once in a while. I'm feeling much stronger right now than I did this morning, though - back on track, back to hope. Oh, how frustrating and disappointing! :( I'm sorry you didn't have better news today, Mandie. I'll send out prayers that you have some follicles that are ready to go by the time your next ultrasound comes around. So sorry to hear about your disappointment Mandie! Maybe they're just waiting to coincide with BU's "Fall Follies." (Okay, that was bad, but it's what popped into my head as soon as I read about the "follies"). You are one brave, beautiful woman for sharing your journey so openly.